Restless Times. Archaeology in Germany is a major temporary exhibition in Berlin of the most impressive archaeological finds in Germany during the past 20 years. See it from 21 September 2018 to 6 January 2019. Top exhibits at the Restless Time. Archaeology in Germany exhibition in Berlin end 2018. Restless Times. Archaeology in Germany (Bewegte Zeiten. Archäologie in Deutschland) is a major temporary exhibition that will present in Berlin the most spectacular archaeological finds in Germany of the past 20 years. It will include over a thousand exhibits from all parts of Germany exhibited as part of a historic trans-regional European network of exchanges and movements. The exhibition will be held from 21 September 2018 to 6 January 2019 in the large Martin-Grophius-Bau exhibition center in Berlin. The Restless Times. Archaeology in Germany (Bewegte Zeiten. 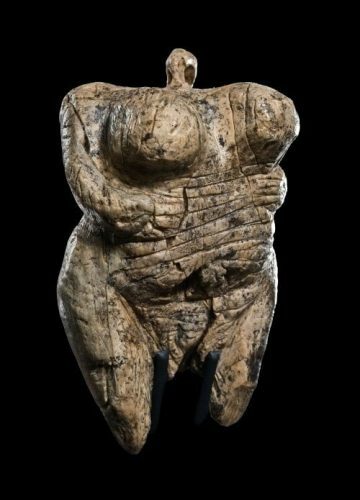 Archäologie in Deutschland) exhibition will bring together for the first time ever in Berlin thousand items loaned by 70 individuals and institutions from right across Germany. 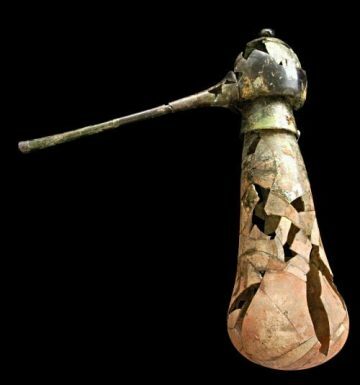 These items were found only during the past 20 years in around 300 sites in Germany and dates from the Stone Ages to artworks damaged during the Second World War. Digital communication and high-speed transport are bringing people ever closer together but globalization is not a modern phenomenon. The exhibition will show how trans-regional networks and all of their concomitant effects have always been an inherent part of society, and have fundamentally influenced people’s lives since prehistoric times. As part of the European Year of Cultural Heritage 2018, the Restless Times. 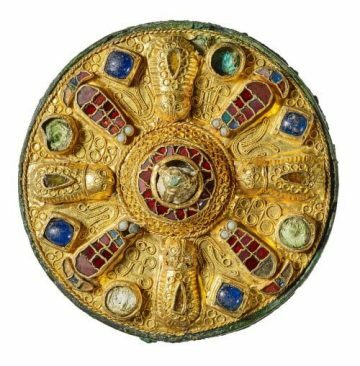 Archaeology in Germany exhibition will highlight the connections between the cultural past and the current day with the aim to make clear the foundations of a common Europe laid several thousand year ago. A major focus of the Restless Times. 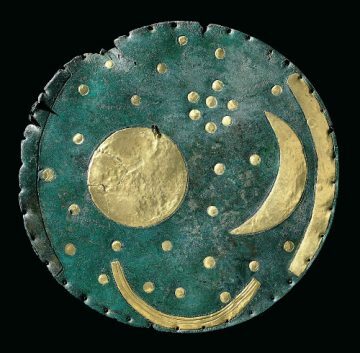 Archaeology in Germany is the movement of people as a connective, basic principle of history: this is the basis for the spread of goods and ideas, the development of trade and progress, and of their associated structural changes and conflicts. For this reason, the exhibition is not divided chronologically, but rather is guided by the four themes of Mobility, Exchange, Conflict and Innovation. The over thousand exhibits from around 300 separate archaeological finds in the past two decades are united by the fact that, despite their uniqueness, they do not stand alone, but always have to be viewed as part of a European network. At the centre of the exhibition in the vast atrium of the Martin-Gropius-Bau stands the port wall of Roman-era Cologne, which was recently unearthed during the construction of the Cologne metro. 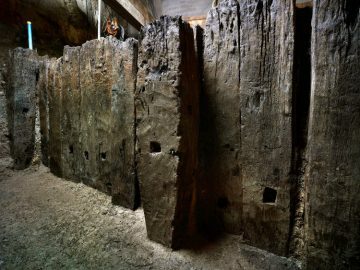 The colossal remains of a 3.5m high retaining wall made of almost 2000-year-old oak planks will be presented together with thousands of fragments from the port basin. In the Mobility section, the human being stands front and centre. People moved about for a whole range of reasons, alone or in large groups, on short trips or across long distances, and their paths are traceable through what they left behind. 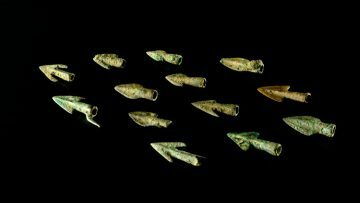 Here, we take a look at four major migrational events of the Neolithic Age that had lasting effects on the European gene pool. A particularly fascinating find is the Neolithic ritual site in Herxheim (Rhineland-Palatinate), where at the beginning of the 5th century BCE people converged from as far away as 400 km for a mysterious sacrificial ritual. Right up to the current day, Europe has been shaped by Conflicts and military clashes. One of the discoveries of recent years is the Bronze-Age Battle at Tollense (Mecklenburg-Vorpommern). On this site, in around 1300 BCE, the earliest attestable battle in the history of Europe was fought. Conflict also emerges on another, intellectual level, in the form of iconoclasm. The Berlin sculptural find can be understood as an example of this, with the 16 works stemming from an exhibition of “degenerate art” organized by the Nazis in the 1930s for propaganda purposes, which were stored together with other seized artworks in an apartment that was destroyed in 1944 by bombing raids. In the Exchange section, the focus is on commodities. A broad arc is drawn from the production of raw materials to distribution and professionalized trade, and the social and urban planning changes that went along with them. 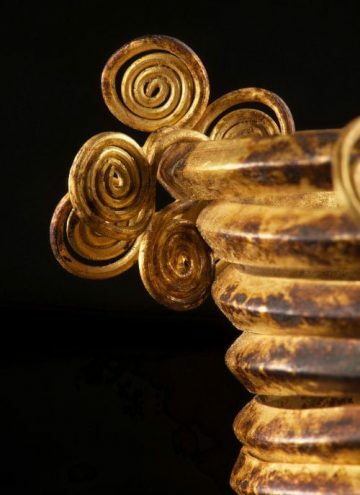 Exhibits such as the Gessel Gold Hoard (Lower Saxony) with 82 standardized gold spirals, or the Oberding Copper Treasure (Bavaria), with 796 identical clasp ingots bundled into groups of 10, show strikingly that even 4000 years ago there were transregional trading units. In the old centre of the city of Lübeck however, trade has to be understood in a to-tally different way. Here, in the 12th century, standardized buildings were constructed to cater to merchants, with still intact wooden basements designed to hold trading goods. In the final section, the exhibition turns its focus to Innovations – both in technical and intellectual terms. 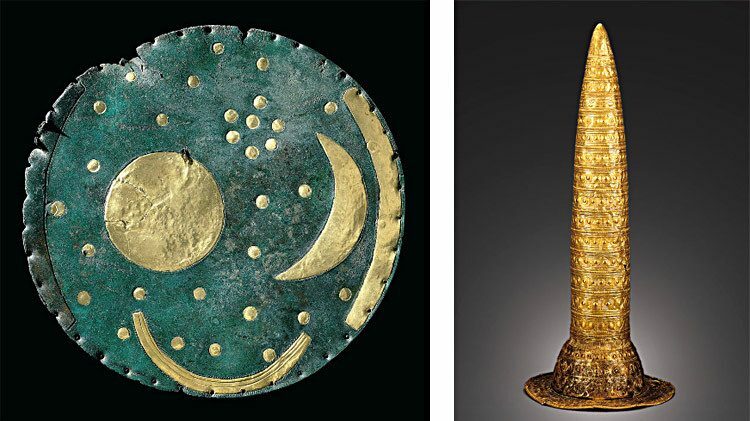 Exhibits include humanity’s earliest ex-ample of figural art, the approximately 35,000-year-old Venus of Hohle Fels (Baden-Württemberg), and the Bronze-Age Nebra Sky Disk (Saxony-Anhalt), with the world’s oldest known concrete depiction of the cosmos. Restless Times. Archaeology in Germany (Bewegte Zeiten. Archäologie in Deutschland) will be in the Martin-Gropius-Bau from 21 September 2018 to 6 January 2019. Opening hours of the Martin-Gropius-Bau exhibitions are usually Wednesday to Monday from 10:00 to 19:00, closed on Tuesdays. Tickets will be separate from the other Berlin State Museums. The neo-Renaissance Martin-Gropius-Bau is in Niederkirchnerstraße 7 next to the Topographie des Terrors and a large surviving section of the Berlin Wall near Potsdamer Platz and Check-Point Charlie. 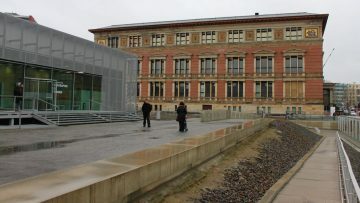 (The Berlin Mauer was so close to the main entrance of the building that a side entrance was mostly used during the Cold War.) The exhibition center was designed by a distant relative of Bauhaus architect Walther Gropius and is used for major temporary exhibitions. The Restless Times. Archaeology in Germany (Bewegte Zeiten. Archäologie in Deutschland) is arranged by the Museum für Vor- und Frühgeschichte – Staatli-he Museen zu Berlin in cooperation with the Verband der Landesarchäologen in der Bundesrepublik Deutschland to mark the European Year of Cultural Heritage 2018. Before, during and after the temporary exhibition, the fantastic permanent collections of the Berlin State Museums will remain a major cultural attraction in Germany. Book Berlin Tours at GetYourGuide.